Some of my favorite Marvel comics books over the past 10 years have been comics which reintroduce B level characters, or characters who have faded away over the course of time. The reemergence of Iron Fist, Spider-Woman, the Hood, Rhino and even Bucky have been the focus of my favorite stories and possibly the reason for Marvel's mini boom of success. Their writers are dusting off old characters and giving the a past (in Bucky's case), a identity (in Iron Fist's case) and a soul (as in the case of Rhino). 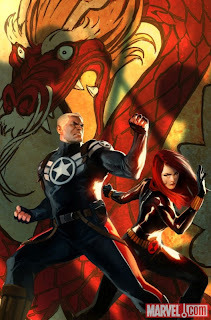 Of the 4 characters I mentioned previously, Ed Brubaker has done extraordinary work for 2 of them (Bucky and Iron Fist). In Secret Avengers #6 it seems he is trying his hand at yet another forgotten hero with little to no superpower: the Master of Kung Fu, Shang-Chi. Shang-Chi was a creation of the early 70's when the martial arts were on television and in the theaters. Naturally, Marvel road the success and created Shang-Chi much in the same way they created Squirrel Girl...squirrels were just so in at the time. In the comic of the day, Shang-Chi is told of the plot to resurrect his evil father Dr. Fu Manchu. Steve Rogers goes to Shang-Chi for both his help and to keep him close. Shang-Chi will most likely be key in the Secret Avengers books for the next couple of months. The anticipation of what his father will have in store for him and what a Master of Kung Fu can do against a master of Evil with be interesting to see. Based on Ed Brubaker's track record I would expect to see Shang-Chi as a regularly appearing character in most every Avenger title from now until Marvel uses him to death...once again.